Atletico Madrid moved level on points with La Liga leaders Barcelona thanks to a comfortable win over Granada. 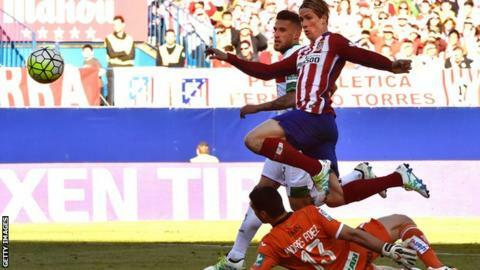 Koke drove in the opening goal from 12 yards after Fernando Torres' shot had been blocked. Former Blackburn Rovers forward Ruben Rochina hit the post for Granada before half-time, but Torres then ran on to Koke's pass to double Atletico's lead. Substitute Angel Correa sprinted on to Saul's flick to slot in a late third for Diego Simeone's side. Atletico moved on to 76 points alongside Barcelona, who lost 2-1 at home to Valencia later on Sunday; Granada remain one point above the relegation zone. Simeone's team secured a first clean sheet in four La Liga matches, meaning they remain on course to beat the all-time competition record for the fewest goals conceded in a season. Atletico have let in 16 league goals this season; the record low is 18, achieved by Deportivo La Coruna in 1993-94. Match ends, Atlético de Madrid 3, Granada CF 0. Second Half ends, Atlético de Madrid 3, Granada CF 0. Óliver Torres (Atlético de Madrid) wins a free kick on the left wing. Foul by Abdoulaye Doucouré (Granada CF). Attempt missed. Jean-Sylvain Babin (Granada CF) right footed shot from the centre of the box misses to the right. Assisted by Rubén Rochina following a corner. Attempt blocked. Rubén Rochina (Granada CF) left footed shot from outside the box is blocked. Assisted by Fran Rico. Corner, Granada CF. Conceded by Diego Godín. Foul by Óliver Torres (Atlético de Madrid). Rubén Rochina (Granada CF) wins a free kick in the attacking half. Attempt missed. Rubén Rochina (Granada CF) left footed shot from outside the box is close, but misses to the right from a direct free kick. Óliver Torres (Atlético de Madrid) is shown the yellow card for a bad foul. Adalberto Peñaranda (Granada CF) wins a free kick in the attacking half. Rubén Rochina (Granada CF) wins a free kick in the defensive half. Goal! Atlético de Madrid 3, Granada CF 0. Ángel Correa (Atlético de Madrid) right footed shot from the centre of the box to the bottom right corner. Assisted by Saúl Ñíguez with a through ball. Attempt missed. David Barral (Granada CF) header from the centre of the box misses to the right. Assisted by Fran Rico with a cross following a set piece situation. Augusto Fernández (Atlético de Madrid) is shown the yellow card for a bad foul. Foul by Augusto Fernández (Atlético de Madrid). David Barral (Granada CF) wins a free kick in the defensive half. Attempt missed. Ángel Correa (Atlético de Madrid) left footed shot from the right side of the box misses to the left. Gabi (Atlético de Madrid) wins a free kick in the defensive half. Substitution, Atlético de Madrid. Óliver Torres replaces Koke. Rubén Rochina (Granada CF) is shown the yellow card for a bad foul. Foul by Rubén Rochina (Granada CF). David Barral (Granada CF) is shown the yellow card. David Barral (Granada CF) wins a free kick on the right wing. Ángel Correa (Atlético de Madrid) wins a free kick in the defensive half. Foul by Fran Rico (Granada CF). Substitution, Granada CF. Fran Rico replaces Dimitri Foulquier because of an injury. Attempt missed. David Barral (Granada CF) header from the centre of the box is too high. Assisted by Rubén Rochina with a cross following a set piece situation. Foul by Stefan Savic (Atlético de Madrid). Attempt missed. Fernando Torres (Atlético de Madrid) right footed shot from the centre of the box misses to the right. Assisted by Saúl Ñíguez. Substitution, Granada CF. David Barral replaces Rene Krhin.